In a food processor, pulse together 3/4 cup + 2 Tbsp granulated sugar with lime zest until finely ground, about 1 minute. In the bowl of an electric stand mixer fitted with the paddle attachment, whip together butter with lime sugar mixture until pale and fluffy (if you don’t have the paddle attachment that constantly scrapes bowl, then occasionally throughout entire mixing process, stop mixer and scrape down sides and bottom of bowl). Mix in egg, then mix in egg whites one at a time, adding in vanilla with second egg white. In the liquid measuring cup used to measure buttermilk, whisk together buttermilk with lime juice. Working in three separate batches, beginning and ending with flour mixture, add 1/3 of the flour mixture alternating with 1/2 of the buttermilk mixture and mixing just until combined after each addition. Divide batter among 12 paper lined muffin cups. Bake in preheated oven until toothpick inserted into center of cupcake comes out clean, about 18 – 20 minutes. Remove from oven and allow to cool several minutes in muffin tin, then transfer to a wire rack to cool slightly while preparing simple syrup. In a small bowl, whisk together 1 Tbsp lime juice with 1 Tbsp granulated sugar until sugar has dissolved. Brush mixture over warm cupcakes (use all of it, I did about 2 light coats over each cupcake). Allow cupcakes to cool completely. Mix in 1/4 cup powdered sugar then mix in maraschino cherry juice and optional red food coloring. With mixer set on low speed, slowly add remaining 2 1/4 cups powdered sugar (add an additional 1/4 as needed to reach desired consistency), then increase mixer to medium and whip until light and fluffy. 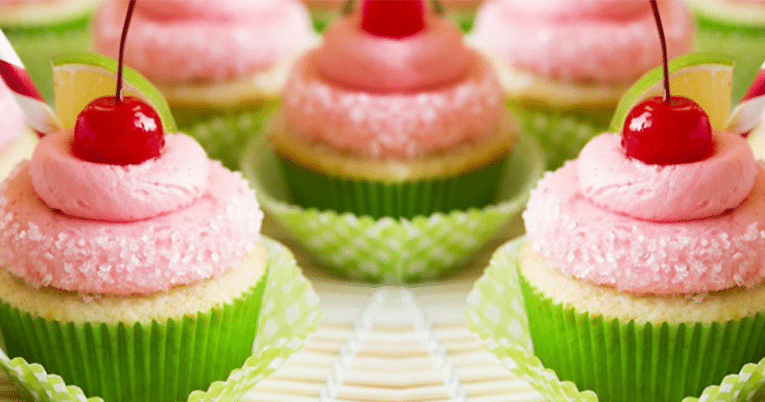 Pipe or spread over cooled cupcakes, top with each with a maraschino cherry and a lime slice and sprinkle edges with sprinkles if desired.